South Australia was colonised in 1836, and is the only free-settled state in Australia. South Australia’s Faunal Emblem is the Hairy-Nosed Wombat. South Australia’s Floral Emblem is the Sturt Desert Pea. South Australia’s Gemstone is the opal. South Australia’s oldest building is Holy Trinity (Anglican) Church, on North Terrace, which was built in 1838. South Australia is home to the oldest mosque in the country, the Marree Mosque, which was built sometime between 1861 and 1882. Adelaide is home to the oldest mosque still in use, the Central Adelaide Mosque, which was built in 1888. That’s three years earlier than the oldest mosque in the UK, and in fact before any mosques in Northern and Western Europe (other than Spain). Adelaide’s Botanic Garden has the largest and oldest glasshouses in the Southern Hemisphere. South Australia is the opal capital of the world. South Australia is located in south-central Australia. South Australia is the fourth-largest of the States and Territories. South Australia shares borders with all of the other mainland states, and with the Northern Territory. South Australia has an area of 984 377km2. South Australia has 3700km of coastline. South Australia has the bottom 650km of the River Murray, which is the only major river in the state. (South Australia also follows the British tradition of naming rivers, putting “River” first, rather than the American one, which puts “River” second. In all other states and territories, it is known as the Murray River). South Australia’s coastal waters are among the cleanest in the world. South Australia’s largest permanent lake is Lake Alexandrina, which is 306km2. South Australia’s lowest point is Lake Eyre, which is 12m below sea level. South Australia is the driest of the States and Territories. South Australia averages 2500 hours of sunshine each year. (There are 8766 hours in a hear, 4383 of which are nighttime). South Australia’s highest recorded temperature if 50.7°C. Adelaide’s coldest recorded temperature is 0.2°C. South Australia is divided in two by the Goyder’s Line – above which it doesn’t rain. South Australia comprises almost 13% of the Australian land mass, but only a little over 7% of the total population. South Australia has a total population of 1.7 million, with 1.3 million living in Adelaide. 77% of South Australians live in the Greater Adelaide Area. South Australians have the second-highest median age of all States and Territories. South Australia’s capital city is Adelaide. Adelaide was designed in a grid pattern by Colonel William Light. Adelaide is the only city in the world completely surrounded by parklands. Adelaide has the closest and most accessible beaches of any Australian capital city. Adelaide has the largest fresh produce market in the Southern Hemisphere, and the longest-running one in Australia. Adelaide has the only Migration Museum in Australia. South Australia has 13 wine regions. South Australia produces 50% of Australian wines, and 65% of national wine exports. South Australia has 48% of Australia’s vineyard area and 25% of the barley area. South Australia is the fish-farming centre of Australia. Adelaide is home to the National Wine Centre. South Australia is known as the “Festival State”, and Adelaide is considered to be the culture and arts capital of Australia. Adelaide has Australia’s first purpose-built convention centre and its first modern multi-purpose performing arts venue. Adelaide has the highest ratio of cafés and restaurants to residents of any Australian city. Adelaide has the largest display of Aboriginal culture and artefacts in Australia, house in the South Australian Museum and Tandanya, the National Aboriginal Cultural Institute. Adelaide is home to the national food and wine festival, Tasting Australia. Adelaide’s O-Bahn is the longest guided busway in the world. South Australia has the National Motor Museum, which has over 300 motor vehicles. South Australia is home to the largest vintage car rally in the Southern Hemisphere, the Bay to Birdwood. South Australia is home to the largest freshwater sailing regatta in the Southern Hemisphere, the Milang to Goolwa. South Australia has its own (quickly dying) German dialect, Barossadeutsch. South Australia is home to Australia’s oldest German town, Hahndorf. (And it’s not in the Barossa!). Adelaide is home to the first German-language diploma school in the Southern Hemisphere. The four-story-tall Big Orange at Berry in the Riverland is the fifth-largest Big Thing in Australia. Larry the Lobster, in Kingston SE, is the second-largest Big Thing in Australia. The 18+-metre-tall Big Rocking Horse in Gumeracha (in the Adelaide Hills) is the largest Big Thing in Australia. South Australia has some of the strictest quarantine regulations in the world. South Australia, along with Victoria, was the first place in the world to use the secret ballot, in 1856. SANFL was the first Aussie Rules Football league in Australia, founded 14 days before Victoria’s league. South Australia was the first state to allow nudist swimming. South Australia is home to the most venomous snake in the world, the Inland Taipan. South Australia is the only place in the world where a milk-based drink (Farmer’s Union Iced Coffee) outsells Coca-Cola – by almost three to one. It’s also one of only two places outside of Asia where the best-selling bottled beverage is not Coca-Cola (the other being Irn-Bru in Scotland). South Australians drink around 36 million litres of Farmer’s Union Iced Coffee each year. South Australia was the third place in the world, after Russia and the US, to launch a rocket into space. (On Britain’s behalf). I’m not going to be talking about the Australian accent, because I’m sure you’ve heard it all before, but I’m going to point out a couple of features of the South Australian accent. I’m also not going to be talking about my own accent, because it’s a hopeless mish-mash which includes eastern states, English, Scottish, and Kiwi traits, as well as most of the SA traits. I don’t really want to use myself as evidence for any of these things, but rather my sister, (occasionally) my mother, and pretty much everyone else around me. Yes, there is one, and yes, it is different from other Australian accents. I’ve mentioned before that I partially disagree with the commonly-used classification system of Australian accents (Broad, General, Cultivated), but even proponents of this system will agree that South Australians sound different. Of course, many of the features I’m going to talk about occur in other Australian accents, too, so I’m only going to point out the ones that don’t occur, and tell you what happens instead in eastern states accents. The first feature about which I’m going to talk is non-rhoticity. Now, this is a pretty obvious thing to say, given that almost all British dialects, Australians, Kiwis, and even a couple of obscure American dialects (in Louisiana, I think) are non-rhotic. A Simpson sums up my opinion of the new logo. It’s meant to represent a door, but seriously? You need a new logo for SA, so you do it by getting a map of Australia and cutting the state out of it? Basically, what “non-rhotic” means, is that we don’t pronounce the “r” on the ends of words that end with “er” (or “re”), such as water, metre, feature, swimmer, theatre, and so on. Instead, it is pronounced as something like “a” or “uh”: worta, meeta, feecha, swimma, theata, etc. The next feature is the trap-bath split. Basically that means that the two words are pronounced different, “trap” with a short “a” as in “cat”, and “bath” with a long “a” as in “father”. Of course, all varieties of Australia have this split, but it is the extent to which it exists in South Australia which is notable. A lot of words are pronounced with a long “aa” in SA which are pronounced with a short “a” in the eastern states, mostly where the “a” is immediately followed by an “n” or an “m” – for example; dance, advance, plant, and branch, for example, but also other words, such as grass and graph. A word of advice: never get a South Australian and any other Australian to since the national anthem together. The next feature is the y-glide. Like non-rhoticity, this is a feature of British English (and not American English), so it’s not too surprising that it exists in Australian English, too. However, like the trap-bath split, it is not as fully realised as in Queen’s (RP) English. Basically, what a y-glide is, is that “u” or “oo” sounds are very often pronounced with a “y” in front. Such words are new, due, Tuesday, tune, and so forth. (Which is why American children sometimes mix up “do” and “due”, but Australian children never would, because for us, the two words sound different). But there are a lot of words where there is no y-glide, but where there would be in RP English (and some Australians might pronounce it, but it’s rare), such as suitable, blue, and diluted. However, Australians can sometimes be lazy in actually pronouncing this y-glide, usually after a “t” or a “d”. Thus, due and dew are “joo”, Tuesday is “choozday”, tune is “choon”, and dune is “joon”. This also means that common word combinations which feature a “d” or a “t” followed by a “y” are also pronounced this way; for example, “last year” and “next year” are pronounced “lars jeer” and “necks jeer”. The old logo, which I vastly preferred. The next feature is l-vocalisation, which, as far as Australian accents are concerned, is a uniquely South Australian thing. Which this means is that an “l” which falls on the end of a word or immediately before another consonant sounds more like a “w” or a “y”. It looks a bit silly when you write it, so I’m not going to really try. I’ll give you an example, though; a boy named Will has his name pronounced with the same sound at the end as at the beginning. His full name has “yam” tacked on the end: Wiwyam rather than William. “Miwk” rather than “milk”. I’ve read that l-vocalisation also occurs in Cockney, but I’m pretty sure that South Australians would get it from all the Scottish settlers. Although I have not read anywhere that this is a feature of any Scottish accent, I’ve noticed that in Scots, words such as “football” are written “fitba” or “fitbaw”, which to me implies that something like l-vocalisation is happening to the final consonant. The next feature is full diphthongs, which is another thing which, if not unique to South Australia, is less likely to occur in other states. This means that some words which are pronounced with one syllable in other states, such as near, beard, hear, here, tour, grown, known, and so forth, are in South Australia pronounced as “nee-ya” (near), “bee-yud” (beard), “hee-ya” (hear and here), “too-wa” (tour), gro-wun (grown), no-wun (known), etc. The final feature I’m going to mention doesn’t have a name – at least, not as far as I’m aware. It’s something akin to t-glottalisation, except that the “t” in question isn’t actually pronounced as a glottal. As far as I can work out, from listening carefully and trying out words in my own mouth, we move our tongue and mouth into the correct position for the “t”, but stop vocalising before we can pronounce it. Thus, words such as “fruit”, “ute”, and “plant”, are often missing their final “t”, and words like “Atlantic” are often missing the initial “t” (or, the “t” at the end of a syllable). So, for example, in a word like FruChocs, which, despite missing the “t” on the end of initial syllable, a South Australian will hear as “fruit”, whether consciously or subconsciously, which (for me, anyway) immediately conjures up an image of exactly what a FruChoc is – fruit and chocolate. Fritz. (Other states have Devon). And Smiley Fritz. I’m sure you’ve all encountered them. No doubt those of you living in other countries have had automatic checkouts for longer than us in Australia, particularly us in South Australia. Ignore the plastic bags… We don’t use them anymore in SA. – a conversation between the checkout and my mother. … And complaints about job loss, unemployment, and replacing people with robots. So I’m not going to get into all that. I’m sure you’ve heard it all before. Instead, I’d like to talk about its voice. And the things it says. And not about its annoying smug voice and the obnoxious things it says, but about its accent. You see, pretty much all of the automatic checkouts I’ve been to (in Australia, anyway) have English accents. And they can get away with that, because particularly with Australian accents divided into three categories (which I contest, by the way), one of which being “Cultivated Australian” (which I call RP or Queen’s English because, really, that’s what it is), no-one bats an eyelid and an English automated checkout. They probably have them in New Zealand, too. I tell you what, the Scottish think they have it bad with computerised voices never having Scottish accents, but at least people think of them when someone asks, “What massive English-speaking consumer market is not being catered to in the computerised voice sector?”. No-one thinks of the Australians, so we get English accents on our computers. At least they didn’t try to put American accents on them. People would probably stage a protest if their automatic checkout told them off in an American accent. Just as it says: five foreign foods or drinks I really like (and wish would become a thing in Australia), and five I really didn’t like. In no particular order. The first item on my list is Currywurst. Currywurst is a German invention, consisting of chopped-up sausage (usually Bockwurst or pork sausage, I think), topped with tomato sauce and sprinkled with curry. I’m don’t know whether this sounds nice to you or not, but believe me, it’s yummy. I just can’t believe it hasn’t caught on in the Hills, at least – you can get just about every other sort of Wurst in Hahndorf. 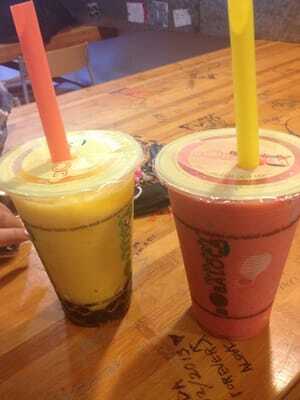 The next item on my list is Fruit Boba. It took some searching to find that name. I’d just been calling them “those Fruit Slushies from Singapore“. Obviously, they’re from Singapore, and they’re a brilliant idea. The basic principle is simple: Somewhere in the shopping centre or market place, you will find at least one stand with an amazing array of fruit (and sometimes vegetables), usually in slices or chunks, on display behind the glass bit. You point to whatever combination of fruit (and/or vegetables) you want, and the person behind the stand sticks it all in a blender with some ice cubes, blends it up, and puts it in a plastic cup with a straw. And away you walk, basking in the awesome cool sweetness of blended-up fruit and ice in the sticky Singapore heat. The third item is Mosto. Mosto is a Spanish drink; basically sweet grape juice. Now, I don’t usually like grape juice, but for mosto I make an exception. The best part is that it comes in both blanco (white) and tinto (red), just like wine. The fourth item is Bulgogi. Now, this is something which, over the past few years, with the rise of K-Pop, has become a thing in Australia. However, it’s very hard to find anywhere that does it right here. Most places (and there’s now a Korean food shop in just about every suburb) will give you a plate with rice on one side and bulgogi meat on the other side. Some do it better than others. Some places will even add a little kimchi and maybe soupy stuff. But this, to me, is not true bulgogi. To me, bulgogi means going into a little hole-in-the-wall place on the backstreets of Daejon or Pusan, paying somewhere around the equivalent of $7 for four people, and being shown to a knee-high table surrounded by pillows. It means sitting down on the pillows on the floor, and being given a huge pot of bulgogi, a frying tray thing, another huge pot of white rice, more little bowls of condiments than you can count – purple rice, yellow rice, horseradish, black bean stuff, kimchi, all sorts of other things I can’t even name – and a plate of lettuce. It means grabbing a huge lettuce leaf, nestling it in the palm of your hand and filling it with rice and meat and condiments by means of thin metal chopsticks, before wrapping it up and trying to shove it all in your mouth at once. Since bulgogi was the only thing we knew how to ask for, it’s pretty much the only thing we ate in Korea. We got so sick of it while over there, but when we got back, we can’t get enough of it! Another Korean dish, which I’ve actually found some pretty good versions of in Adelaide, is dolsot bibimbap. You can get just plain bibimbap, but that’s not as exciting – dolsot bibimbap comes in a hot stone bowl. Basically, it’s a bed of rice, on which you have bulgogi meat, grated carrot, cucumber, and various other condiments, all topped with a raw egg. (Or a fried on, in the case of plain old bibimbap). The final item on my list of stuff I like is Frozen Yoghurt. This is something I tried in Spain, but I don’t think it’s a Spanish thing (ice-cream stands were a lot more common over there, from what I could see. I’d include the ice-cream I had over there, but I’m out of space). My host sister told me that it’s quite popular in Brasil. Anyway, basically what happens here is that you get a huge squirt of frozen yoghurt, which looks a lot like a soft-serve in a tub. But tastes a whole lot better. Then, you can pick your choice of toppings – bits of fruit, nuts, chocolates and sweets – and finish it off by drizzling it with flavoured topping or caramel. Yum. Okay, now onto my list of stuff I don’t like. I’ll kick of the list with two things: Sauerkraut and Kimchi. I’ve put these two together because I really can’t tell that much difference between them. Sauerkraut is more finely chopped, and kimchi has copious amounts of spices in it, but the basic principle is the same: fermented cabbage. Oh, I know people who swear by kimchi and claim it has all sorts of amazing properties, such as fending off swine flu, and I’ll even have a little kimchi on occasion (very little) – after all, the spices mask the taste of fermented cabbage. But basically, I don’t like either of them. The second item on my don’t-like list is Paella. To give it its due, I’ve got to admit that my dislike of this iconic Spanish dish probably stems from my dislike of seafood, but really – paella, to me, seems little more than watery fried rice with oversized prawns. The third item on my list is Root Beer, Doctor Pepper, and Spezi. Pretty much the only reason Coke and Pepsi aren’t on this list is because they’re (very) common in Australia. The others aren’t. If you’ve read The Idiot’s Guide, you already know my opinions on Root Beer and Doctor Pepper (both American beverages). If not, you can read it here: https://coveredrachel.wordpress.com/2013/07/02/the-idiots-guide-to-the-usa-drink/. Basically, the conclusion my family came to after trying those two beverages was that Root Beer tastes like a hospital (with black food colouring) and that Doctor Pepper is made of cough medicine, thinned out with added black food colouring. Spezi, on the other hand, is a German drink, and is made by mixing Coke (or Pepsi) with Fanta. It’s probably not too bad if you like both of those drinks, but I don’t like Coke. The fourth item on the list is Macaroni and Cheese. To be honest, I have no idea why I don’t like this signature American dish. After all, basically all it is is pasta with cheese sauce. I have that all the time – with added tuna and vegetables, of course, making it tuna mornay. But the point still stands that, by all sensible reasoning, Macaroni and Cheese should be something I love. And the truth is, I did. For the first two mouthfuls. And then it got thick, and rich, and I felt sick. So who knows? I had it at a couple of places over there, and the same thing happened every time. I don’t know why, but for some reason, Macaroni and Cheese makes it onto the list of foreign foods I don’t like. And the final thing on this list is Summer Pud. Summer Pud is an English dish, a dessert, and I think my dislike of this dish comes from my utter repulsion for soggy bread. Summer Pud basically consists of bread and stewed fruit – strawberries, blackberries, raspberries, blueberries. Actually, the inside is quite nice. Anyway, it steeps for a couple of hours and is served with fruit, juice, or cream. So, there you have it: five foreign foods I’ve tried and loved, and five I’ve tried and hated. What about you? What are some foods you’ve tried overseas? What did you think of them? Today was the Weihnachtsfeier (Christmas Party) at German School. Except it wasn’t, it was upstairs at the German Club, but details. And more than that, today was the day I officially graduated from the German School. (Despite not having actually been the past two weeks). The concert started with the Spielgruppe (Playgroup) “singing” Kling Glöckchen Kling. Since they were all under the age of four, I’ll leave you to imagine how much singing was actually done. This was then followed by the Kindergarten, Reception, and Year 1 children (Sturt Street Campus) doing a poem and song about “Weihnachtslicht”. Some were dressed up as candles, and the song was about giving light from one hand to the other hand across our land. Or something. I can’t find a clip for that. Year 2 told us all about what Christmas means to them. Most of them said that presents were their favourite part, at least two mentioned travelling to various places to visit Oma, and one even said that she was glad she was German, because that meant she had to wait one less day to get her presents than Australian kids. (German kids get their presents on Christmas Eve). Year 3 went “auf Safari” and dressed up as animals, told us a little bit about each animal and where they were from. Year 4 did a poem/play about “Das Zeit-Geschenk”. One of the main speakers rattled everything off so fast no-one could understand anything, but it mentioned presents and postage being expensive (since most of us deal with posting gifts to the other side of the world each year, this is something we’re all familiar with) and then it got muddled, but I gather the moral of the story was about giving time rather than gifts. Then the younger kids sang two songs, “Morgen kommt der Nikolaus” and “Gloria”. And that was Pause (break or interval). After Pause started with the Year 5/6 class and their “Die Deutsche Schule hat Talent” (German School Has Talent). Some of them did, such as the girl who played the flute. Some of them less so, such as the three twelve-year-old African animals from Greenland who had been dancing from the age of three months (allegedly). This was followed by a play by the Year 7/8 class about “Die Grillsaison”. Turns out that barbeques are just as popular in Germany as in Australia, it’s just that here, they happen over the Christmas season. Finally, the Year 9/10 class did two plays. The first play was titled “Ein Gespräch im Café” and was a conversation between four girls – from Germany, Austria, Switzerland, and Belgium – about whose country had the best chocolate/soccer players/German/usw. It started with the Swiss girl insisting on her word for Spezie, continued with the Belgian girl arriving and announcing that she had the best chocolate, and finished with all four of them arguing over soccer. Yes, there is only one German-language school in South Australia, and the students come from all three German-speaking countries (the Belgian family’s mother is from NRW, but they lived in Belgium until last year). This can lead to some interesting discussions sometimes. Naturally, Hochdeutsch is what is used and taught, but I’ve definitely heard Dialekt from parents, teachers, and students alike (although the teachers don’t speak it to the students!). And Swiss students do get special consideration in internally-assessed written work. From what I understand, Swiss German doesn’t have an β. The second play was called “Die Überraschungsparty” are chronicled an argument between two children and their parents over organising a surprise party for their friend. The children wanted a stretch limo, a buffet with cavier, a bar with vodka and schnapps, a bouncer, a DJ, a sound technician, usw. The parents, naturally enough, argued against this (particularly once the children revealed that it would cost over 1000 euros), and by the end of it, the surprise party had no limo or bouncer, but had pizza, lemonade, and a CD-player. That was it from the classes, but the awards were next. The 9/10 teacher got the “Secondary Teacher of the Year Award” (possibly a state-wide award), and two students, a Year 10 and a Year 11, got the German Descendants Group Awards – a free scholarship for next year’s tuition. I received this award two years ago and got free Year 11, so I was very happy that one of my closest friends at the school got it this year. Then they handed out our DSDs (Deutsche Sprachdiplom). Except we don’t have the results of that back yet, nor have the actual diplomas arrived from Germany, so some poor person (the Cultural Minister or Officer or something from the German Embassy) came all the way over from Canberra to give us ersatz placebo certificates. The DSD, for those who don’t know, is basically four and a half hours of torture devised by the KMK (Kultursministerkonferenz) for German second-language learners. Except we got through the 3-and-a-half-hour written section in about an hour and a half, got bored out of our minds, and were allowed to leave early. I suppose that’s what happens when you give the exam to native speakers. But something good did come out of it, because we’re now the only school in the southern hemisphere to be DSD-certified, which makes my class the first students in the southern hemisphere to get a DSD at a DSD-certified school. And the German name of our school is no longer “Schule der Deutschen Sprache e.V.” but “Deutsche Sprachdiplomschule (DSD)”. The day finished with the school choir (in which I am thankfully no longer required to be, due to having both the DSD and SACE on at the time everyone else on the school was “learning” the songs) singing “In der Weihnachtsbäckerei” and “Ihr Kinderlein kommet”. I probably could have sung, since we sung both of those songs when I was young enough to be in the choir, and know them both pretty well. And then everyone sang “O Tannenbaum” and “Stille Nacht”. I’m not going to find clips of those, since you should at least know the English versions of them. The lyrics (overleaf of the programme). My friends and I had a bit of a giggle over the English lyrics. (Lyrics were given in both languages, despite the fact that we only ever sing them in German). Someone had decided to translate the lyrics of “O Tannenbaum” rather than finding the English version of the song. I have to give them some credit for rhyming, and it was a pretty reasonable translation, but it was still a little odd, being both not what we’re used to singing and not always making sense. Anyway, then there were a couple of closing speeches, and it all finished. Naturally, people hung around to talk. I had long conversations with both of my teachers (the 9/10 teacher and the 11/12 teacher) – both have taught me on and off for almost five years, even when I was still at normal school. Oh, and the students got Weihnachtsgeschenke (Christmas Presents). My Weihnachtsgeschenk. There was a Berliner, too, but that disappeared before I could take a picture. In total, I became one Berliner, one bottle of water, a green pencil which says “Gut Gemacht!”, a pencil sharpener which says “Deutschland”, a bookmark which sais “Ich lese gern!”, four stickers which say “Wahnsinn!”, “Juchhu!”, “Fantastisch!” and “Sehr gut!”, and a badge which says “Guten Tag”. I’ve got to say it was a little sad – I’ve been with that school for three years now, and that’s it. I won’t be going back next year, and that’s sad. I love German School, I’ve met a lot of friends there and I love the atmosphere. I just hope my German doesn’t get too rusty now. Thank goodness no-one sang “Schnappi”! I have it on good authority that “Schnappi” has been sung previous years, including at the Liedertafel Weihnachtsfest at one of the biggest, oldest churches in Adelaide. Ah, Deutsche Schule.